In a diesel or gasoline engine with direct fuel injection, the fuel is injected through a nozzle with up to 200 bar directly into the combustion chamber. This mixes with the air that was introduced through the inlet valve. 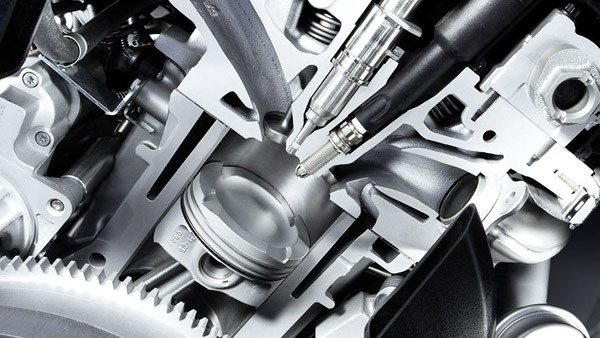 In gasoline engines with direct injection gasoline is supplied mainly in the compression stroke. In diesel engines, however, this happens at the beginning of the power stroke. The advantage of direct injection lies in the optimal turbulence and the improved internal cooling of the combustion chamber. This results in a higher compression, which in turn increases the efficiency. Furthermore it reduces fuel consumption and CO2 emissions. Note: In the conventional injection the fuel is already mixed with air before entering the cylinder. The first automotive direct injection system was produced by Bosch and was developed by Goliath and Gutbrod in 1952. The famous Mercedes 300 SL became the first production sports car with four-stroke engine to be equipped with a direct fuel injection system. The Bosch fuel injectors were placed into the bores on the cylinder wall, and the spark plugs were relocated to the cylinder head. The result was a boost in engine output and efficiency and would remain a signature feature of the 300 SL “Gullwing” for a long time.